Once a month I take a look back over what I find the most interesting posts from the same month in previous years. Here’s what I found interesting when I delved into the archives. In this post I highlight how, in my opinion, Microsoft had ‘dumbed’ down SharePoint on the Office 365 P plan far too much. They had left out or hidden many of the best features of SharePoint. Doing that, I didn’t think, would really drive the adoption of SharePoint. I am glad to say things have changed with the new (Wave 15) version of Office 365 and P Plans. 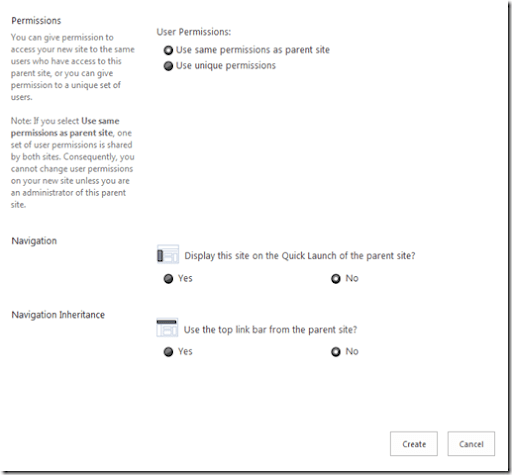 One issue that does arise with SharePoint sites on premise when a backup fails is that the site becomes locked. This is because it is put into ‘read-only/locked’ mode while the backup is taking place. This post details how to unlock a site after something like this happens. This post details how all updates to SharePoint 2010 need to have a manual command line operation run to complete. If you don’t run this then you are not updating your SharePoint 2010 site. After a series on posts on how you can get SharePoint 2010 Foundation running on SBS 2008 I step back and look at the business reasons why this is probably not such a good idea. Here I look at the fact that success is all about working beyond the average. If you want to improve your physique then you need to exercise. Likewise, if you want to improve your business you need to work hard. Simply doing the same every day leads to mediocrity and places you and your business at risk. If you are frustrated that you aren’t getting things done then I would suggest you examine whether you are permitting distractions to syphon you time and productivity away. Does your business have a formal process for handling complaints? Most businesses treat complaints with contempt, however they are some of the greatest sources of feedbacks and can easily be converted into raving reviews. However, to do this you should have a formal process in place. 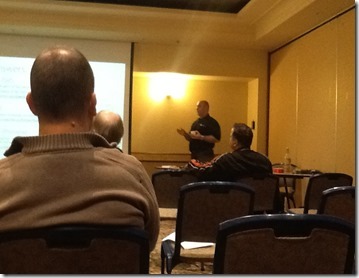 My thoughts on why people don’t use SharePoint and what can be done to overcome this. Dealing with others requires a relationship and in this post I share my thoughts on how you can ensure that your relationships can have greater than normal chance of success. I’m starting to see people get a little agitated about SkyDrive Pro storage so I thought I’d answer some of the most common queries to provide a little balance to what seems to be a bit of unfair ‘Microsoft bashing’ in my opinion. 1. Some seem to think that SkyDrive consumer (i.e. http://live.skydrive.com) is 25GB of storage. If you sign up today it is actually 7GB, just like SkyDrive Pro. Those that current have 25GB where probably grandfathered when SkyDrive consumer was upgraded a number of years ago. However, if you sign up for SkyDrive consumer today you will only receive 7GB for free. However, I am sure it isn’t far away for those plans. It is therefore totally reasonable in my mind that SkyDrive Pro should initially be set at the same free limit (i.e. 7GB), given they are also looking to make then consistent under the same brand. 4. In the previous version of SharePoint Online users had 500MB (yes MB!) of personal storage for only the Enterprise plans. The version of Office 365 increased that to 7GB for EVERY user on EVERY plan. That is and increase of 1,400% in one upgrade! 5. Microsoft is still in the process of upgrading existing users from the previous version of Office 365. This a HUGE under taking across large numbers of users in large numbers of countries. I am sure they are going to offer the ability to upgrade storage capacity for SkyDrive Pro but please allow them to at least get everyone on the same platform! 6. It is hard for me to understand how multiple users in an organization can have > 7GB of personal files unless they are large images or videos. In that case I would be saying that should that information REALLY be saved into SkyDrive Pro? if such users REALLY needed to have everything in the cloud I would be suggesting using SkyDrive consumer for things like large static images and videos and SkyDrive Pro for Office documents. You can run both quite happily together on a desktop and have information syncing to both locations if desired. 7. To me the biggest limitation of SkyDrive Pro and SharePoint Online is the current 250MB maximum file size rather than the 7GB SkyDrive Pro limit. SkyDrive Pro consumer is 2GB per file in comparison, however I expect Microsoft to raise the limit for SkyDrive Pro and SharePoint Online in the very near future. 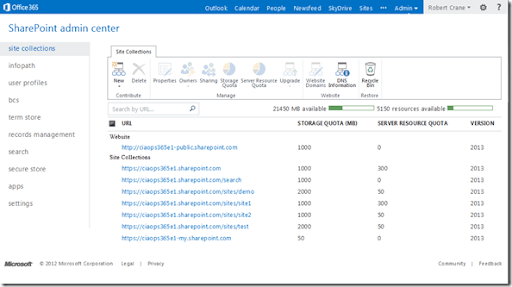 Again, remember, if needed you can generally add to SharePoint Online shared storage so if you REALLY wanted those large files in SharePoint Online, and users already have 7GB in SkyDrive Pro, simply purchase additional shared storage and secure it with standard SharePoint security so only required users can access. So in summary, yes having the option for additional SkyDrive Pro storage, beyond 7GB, would be nice but I’m sure it isn’t too far away. However, this is not really a limiting factor when looking at SharePoint Online as there are alternatives and work-arounds. The birthday discount on my Office 365 and SharePoint Guide only lasts until the end of May (that’s less than 7 days now). After that it will return to its normal price. These days people have most of their personal contacts in social media accounts like Linkedin and Facebook. The good thing about many Microsoft products these days is that they provide the ability to link to these. This is also the case for Office 365. 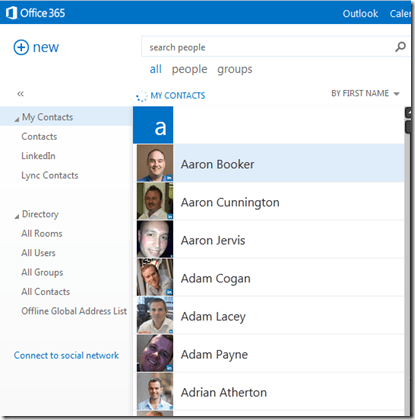 If you login into your Office 365 portal and select People from the menu across the top. In the lower left you’ll find a link Connect to social network. Press this. You should now see a list of social networks you can connect to. Elsewhere I have seen Facebook also appear in this list but for some reason I am only seeing Linkedin on my tenant. 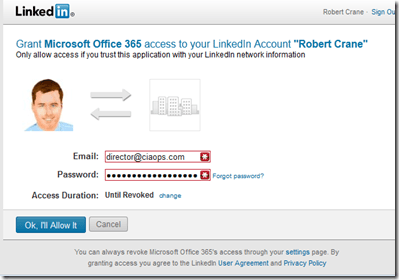 Allow Microsoft Office 365 access to your Linkedin account. 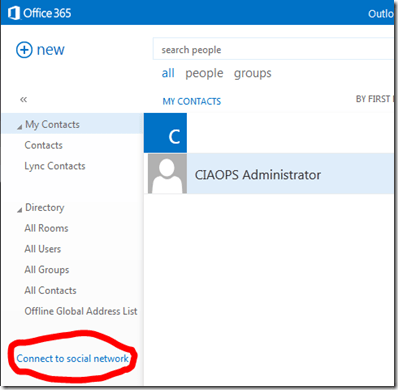 Then in a manner of minutes all you social network should appear as contact in Office 365. 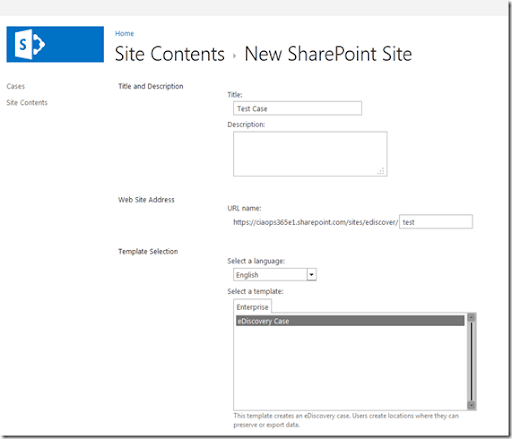 However, I’ll at least show you how to get started with SharePoint Online in this post. 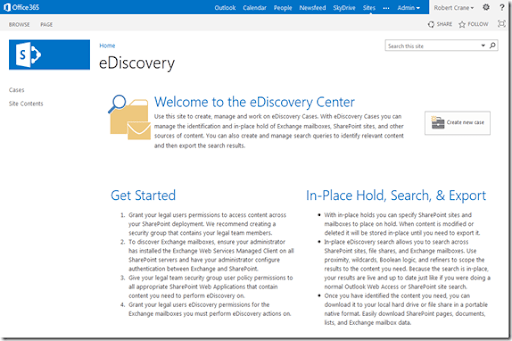 The first steps with eDiscovery in SharePoint Online are to create a seperate eDiscovery site collection. To do that, login to the Office 365 portal as an administrator and select SharePoint from the Admin menu in the top right as shown above. 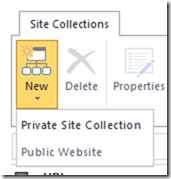 You should now see all the site collections you have configured for your tenant. In the top left select the New button and then private Site Collection from the menu that appears. 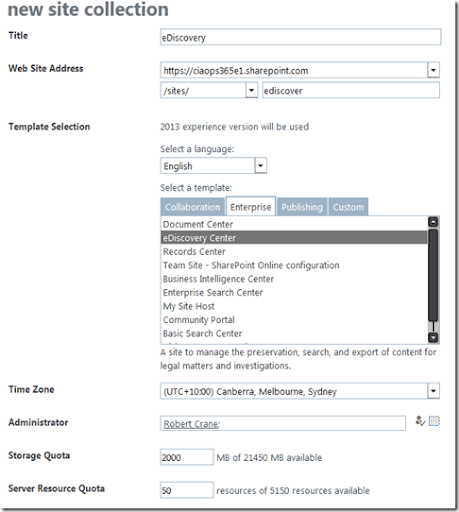 Give the site a meaningful name (here eDiscovery) and URL (here eDiscover). and then select the Enterprise tab in the Template Selection area. In there you should find an option eDiscovery Center, select this. Complete the remaining information for the site and press the OK button to create the site. After a few minutes the site will be created and you can browse to it. When you do you should see something like the above. To get started press the Create new case button on the right. You’ll now be prompted to create a new site. Thus, for each ‘eDiscovery case’ there will be a unique subsite below the eDiscovery home site. Give the new case site a name and URL as shown above. The only site template option you have is eDiscovery. Complete the remaining options and press the Create button. You should now see the new case site as shown above. The next step is to configure the eDiscovery Sets for this case (i.e. where to look for information). Press the new item hyperlink underneath the eDiscovery Sets at the top of the screen. 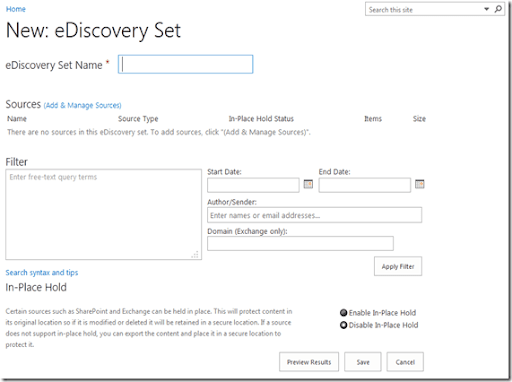 In the eDiscovery Set you need to give it a name and then select the Add & Manage Sources hyperlink next to Sources. 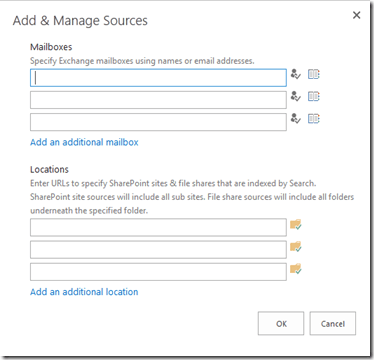 Here you can select both Exchange mailboxes and SharePoint sites to search through. Add the desired locations and press the OK button to save. Once you have defined the sources to search through you need to create a query for these locations, and you can have multiple queries if you want. 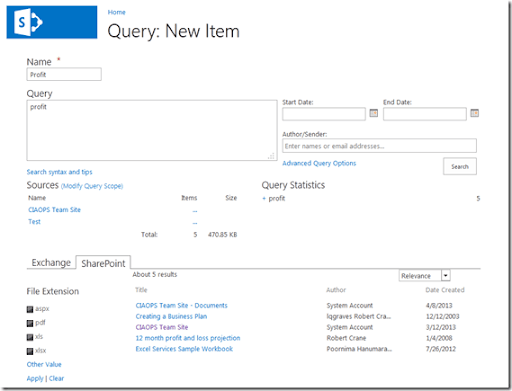 To create a new query select the new item hyperlink just under the Queries heading on the case home page. You can give the query a name and then enter in the terms you wish to search for as shown above. if you press the Search button on the right hand side you will see the results below, again as shown above. 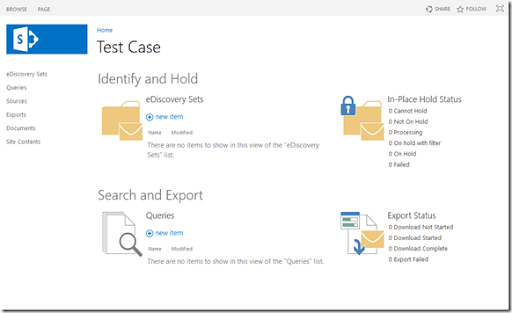 So, that’s the basics of eDiscovery with SharePoint Online. Pretty powerful but yet easy to set up and configure. It is my firm belief that we’ll see more and more eDiscovery requests as we move into the future so having that built-in ability is fantastic benefit of SharePoint 2013 and a great opportunity to understand how to make it really perform. Previously, as I have detailed in this blog, the only way that you could obtain the client app was by installing Office 2013 Pro Plus. This is GREAT news as it makes SharePoint SkyDrive so much easier and available for all users! The SkyDrive Pro client app although now free is still only available for current Windows PC’s but I would expect you’ll see versions for other platforms available very, very soon. So stay tuned to this blog for updates! Before I launch into this tirade I will tell you that I use and like many of the Google products but this sort of experience is typical of what happens when issues do arise with Google services. If you read “In the Plex” by Steven Levy you’ll learn that Google’s focus is on engineering better products rather than providing support. Their philosophy is that ‘”users help users”. That works most of the time but sometimes it would really handy to actually get through a real life human being rather than just a python script. So now where do I go? Only option seems to go “Googling” for an answer and I REALLY shouldn’t have to do that now SHOULD I? If someone else out there know what I can do to get my eBooks listed on the Google Play store I’m ALL EARS! 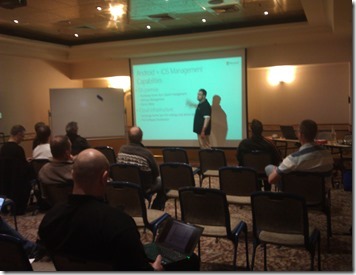 I am happy to announce that the CIAOPS Desktop to Cloud day 2013 was a resounding success. Attendees were able to choose from two tracts with 5 sessions in each as well as a panel discussion to end the day. 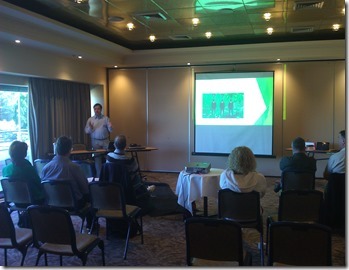 The average approval for all the sessions by attendees was over 85% which is fantastic! for their time not only presenting but preparing for the day. Of course a big thank you goes to everyone who turned up on a Saturday to attend. I hope you got value for your time and enjoyed networking with your peers and the presenters. I’ll make the slide decks available soon for attendees but until then I hope to see you at an upcoming CIAOPS Desktop to Cloud event.